Chemistry, biochemistry and molecular biology, cheminformatics, pharmaceutical chemistry, we have the degree to meet your passions. According to a recent article in C&EN, the world wide chemical industry looks to be very healthy, with combined sales increasing by over 12% in 2017 over the prior year for its list of Global Top 50 chemical companies. Create your future with one of our four undergraduate degrees. Chemistry majors learn best in a practical laboratory setting. Our program will prepare you to contribute to the nucleus of chemical advancements in diverse fields and leave your impression on the world. You’ll quickly learn your way around our advanced labs and equipment, with the majority of your time being spent conducting research (independently and alongside faculty) and creatively exploring the real-world applications of chemistry. Biochemists and molecular biologists investigate biomolecules, studying biological chemistry to understand the molecular and genetic bases of cellular processes. 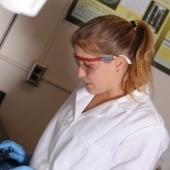 Our interdisciplinary bachelor's degree in biochemistry and molecular biology will prepare you for a rewarding career in virtually any branch of the life sciences you choose, such as agriculture; biotechnology; biofuels; medicine and pharmacology; forensic science; or genomics and molecular genetics. Cheminformatics is at the intersection of chemistry and information technology. A bachelor's degree in cheminformatics will provide you with a unique blended skill set in preparation for a career in this rapidly expanding field. You will complete upper-level course work in both chemistry and computer science. As a cheminformatics specialist, you will play an important role in supporting research and laboratory experimentation by making chemical information accessible and usable. Pharmaceutical chemists work on multidisciplinary teams to formulate, test, and analyze drugs. Our degree program in pharmaceutical chemistry emphasizes research experience, a requirement for many jobs in pharmaceuticals. Upon graduation, you will be prepared to apply your training in chemistry to the process of pharmaceutical synthesis and analysis. You could conduct basic and applied research in chemistry to understand drug compounds or develop guidelines for the US FDA. Chemistry plays a central role in the physical, life, and applied sciences. If you're not a chemistry major, but you'd like to explore the discipline, a minor in chemistry is an excellent option. You'll take 18 credits within the chemistry department, choosing from topics such as polymer chemistry, biomolecular chemistry, and spectroscopy of organic chemistry. A minor in pharmaceutical chemistry allows students from other majors to explore their interests in the exciting science of drug design and analysis. Credits in chemistry, math, and more give students a well-rounded experience. Undergraduate research experiences are possible, as well.